The Samsung SRF680CDLS Refrigerator comes equipped with 4 doors and french doors, made for better organisation of all your refrigerated goods. The mark-resistant finish enables you not to worry about smudges. It comes equipped with a thru-the-door water dispenser and features an ice maker, making it perfect for cooling you off. Containing 680 litres, this roomy refrigerator stores loads of refrigerated goods. 908W x 613D x 1777H. The Samsung SRF680CDLS Refrigerator was added to the Refrigerators category in June 2016. 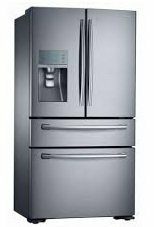 The lowest price GetPrice has found for the Samsung SRF680CDLS Refrigerator in Australia is $2,570.00 from Appliance Central. Other merchants who stock it are Appliance Central, ozappliances.com.au, R.T.Edwards QLD, David Jones .